Bayou Staten Island; GATOR WHAT?! Once you come into this dimly lit restaurant, there is what it seems a mysterious aura it gives off…It would remind you of any high class restaurant located in the heart of Manhattan, although this place is in (out of all places) Staten Island! 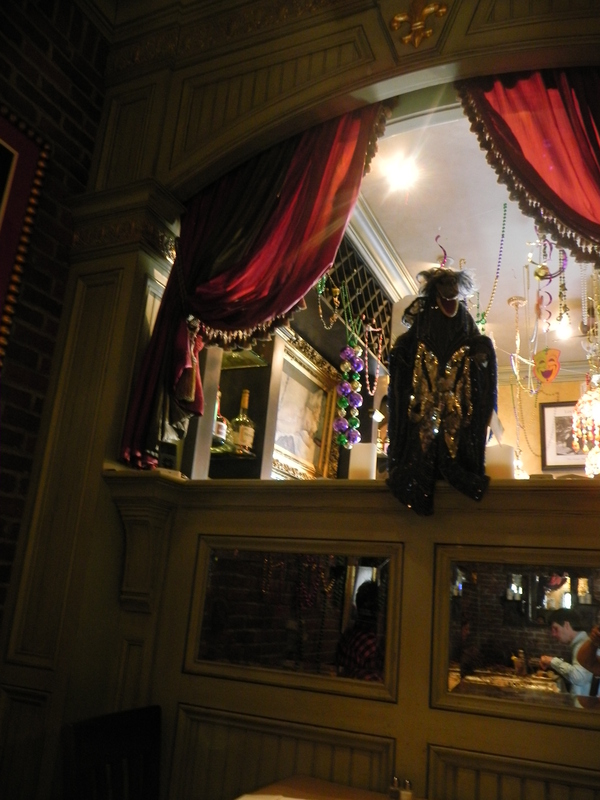 The decor consists of many masks that remind me of masquerades and numerous mardi gras beads hanging against a brick wall. Also, there are full-size old classic style movie posters. Near the back, there is additional seating and to the side the restrooms are not labelled “men” and “women”, but labelled something else. See for yourself! Outside the restrooms, there are awards hung on the wall..but not very much room to gaze at them. Apparently, they serve dinner 3-course prixe fix meals, however Vic and I came during lunch time. 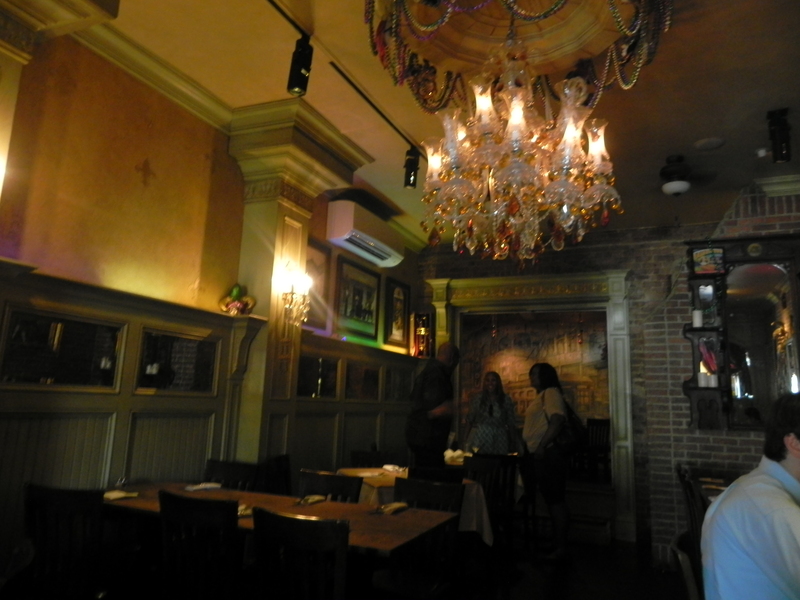 It serves as a quiet romantic atmosphere and the staff are quite nice. 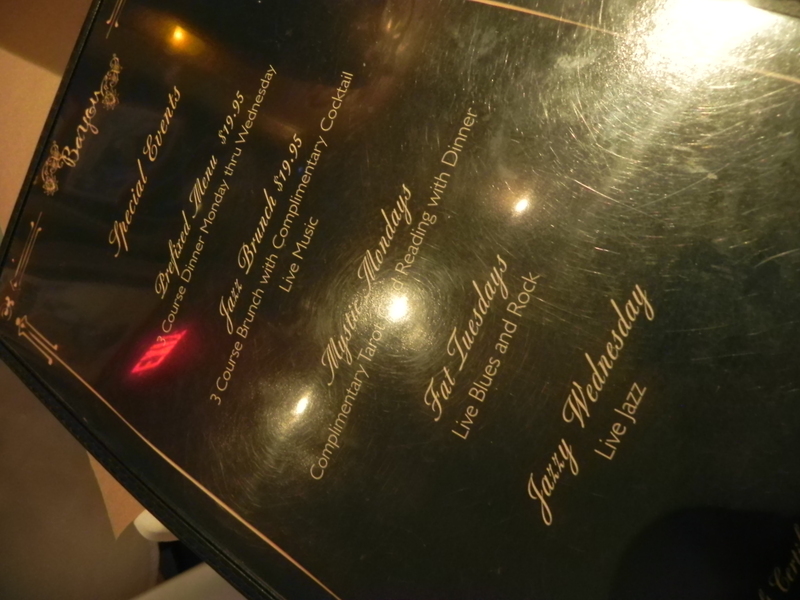 Once seated, the host gives you the menu and a drinks menu. This was a rather interesting find for me. After living on Staten Island for so many years, I didn’t think there would be any exquisite restaurants besides your usual diners. From looks of the exterior, you probably would have no idea what it would look like inside. For me, it was like stepping into another world. Walking in, you already begin to hear the jazzy and soul music. On the left, you have this giant mural of Louie Armstrong with a bunch or awards and plaques.. and on the right, you have the bar before you even step into the actual restaurant section. 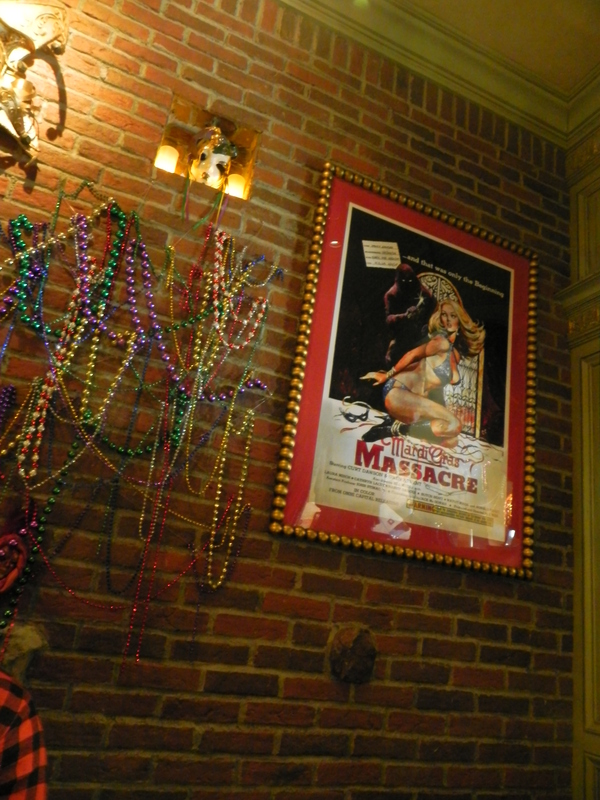 After being seated, you see a lot of things you won’t see in your typical restaurants: Mardi gra beads everywhere , Masquerade masks along the walls and lights, old movie posters, an alligator gypsy, and much more! It does seem a bit understaffed though because our waitress was also the bartender. For the appetizers, I ordered sweet potato fritters. It was recommended by several people after reading some reviews on Yelp, so I guess I had to try it out! Basically, it’s a sweet potato ball with pieces of sausage mixed into it that’s deep-fried with spicy mayo sauce on top. I guess it’s bit pricey for something that seems simple, but they made it pretty good in my own opinion. I was actually completely imagining something else when I ordered it. I was thinking of little fritos or something. 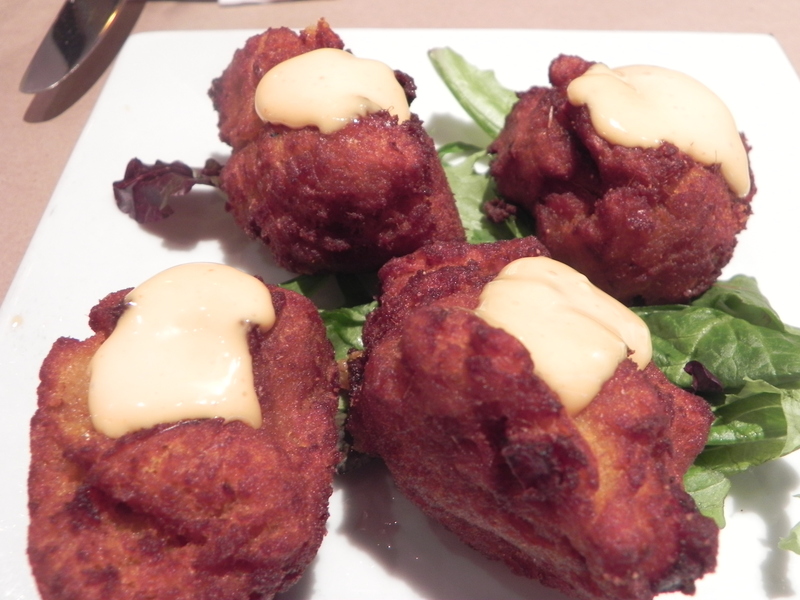 The fritters have a nice crispy texture, but once you bite into it, you get to the core of the sweet potato ball. Its smooth and not too sweet. It’s quite delectable and the spicy mayo makes it so much better. I definitely think that they could have added more spicy mayo to it because it was just so good. The pieces of sausage gave the fritter the salty taste it needed. 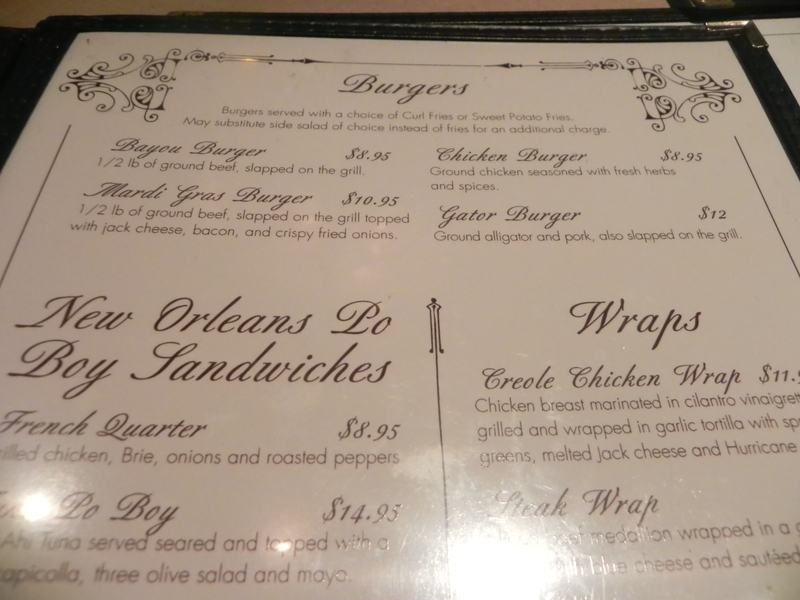 So for the entree… I ordered a Gator Burger. Before everyone gives me crap like “oh isn’t that seafood” or “alligators are endangered” or whatever…. IT’S SEAFOOD AND IT’S NOT ENDANGERED. I also know that it lives in the water most of the time and blah blah blah. Yeah…. I was well aware of what was going to happen after eating this burger. So…. enough that… The gator burger was rather interesting, the least to say. It’s pork and alligator meat that’s been mixed and seasoned into a patty. It was put on a large toasted English muffin with lettuce and tomatoes with curly fries as a side. 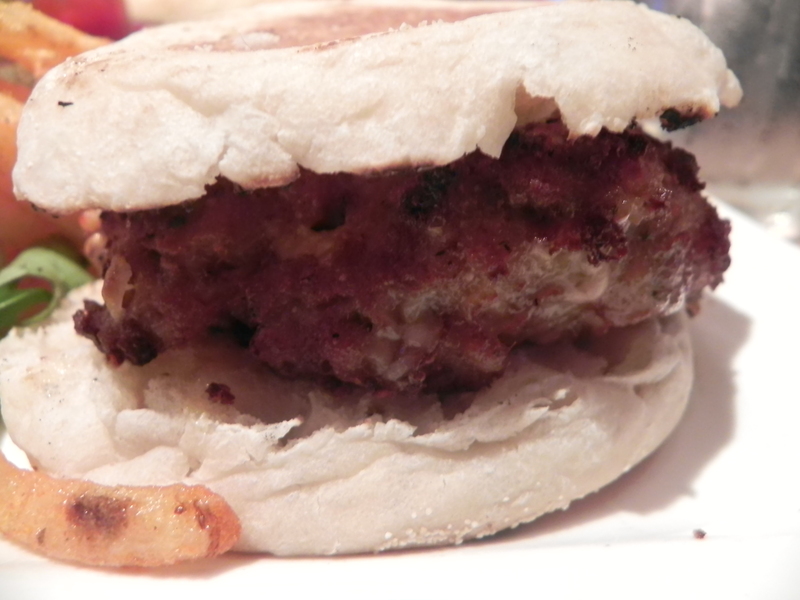 The burger had a crispy outer layer, but the inside of the burger was extremely soft and tender. It was like nothing I ever tasted. It was very salty and herb-y however. I had to add a bunch of hot sauce so it wouldn’t be as salty. It just had unique taste because I never had pork or alligator for a burger before. 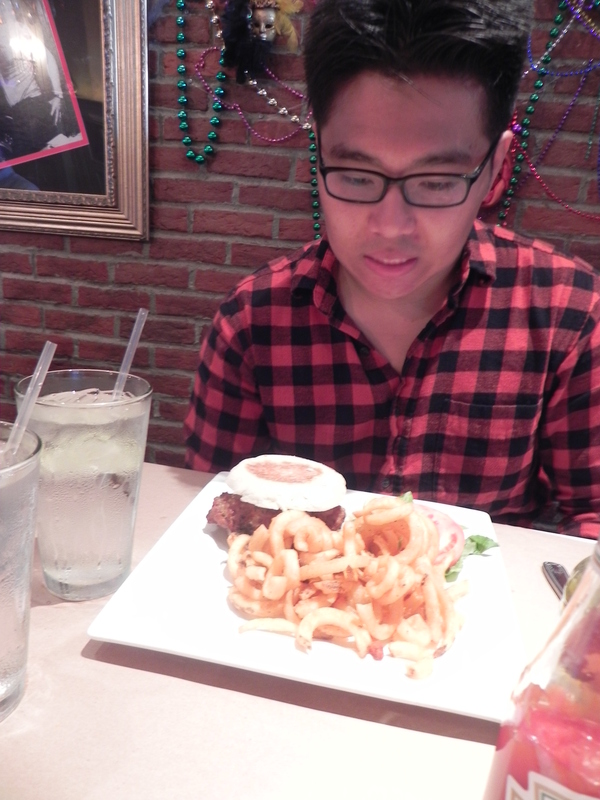 The burger was okay, but it was difficult for me eat it. Like as if my own soul was like fighting with my body as if broke some royal decree. Each bite seemed harder than the next, so I sorta ate the burger as quick as I could after the mid-point. I guess if I wasn’t really thinking about it that much, I probably would have enjoyed it bit more. I guess if you want to try something different, you can check out it this place. I would still recommend despite my weird experience with gator burger. The atmosphere is quiet and romantic and food is decent. It’s not extremely expensive either. Give this place a go if you’re into Southern food! This place was definitely a fancy restaurant and I kept thinking that Manhattan would be a better place for this kind of food. Despite the fact that there were forks and knives falling everywhere in this place (clumsy busboy) — they were nice to us and were professional. Despite its classiness atmosphere, they were using these — brown paper towel table linings beneath our plates. Strange….Sorta drops the classy level down for me. When Vic told me that this place offered GATOR burgers I was like WHAT. HOW and WHAT. Okay, I ordered the French Quarter because I thought it was going to be healthy. I was really being dumb because how can anything with awesome to-die-for brie cheese EVER be healthy? It was probably the most unhealthiest sandwich ever! Haha. There were two pieces of grilled chicken NOT one. The pieces were cooked to perfection, being STILL moist and not of cardboard texture. It was of course not a very lady-like meal since the whole thing was covered in grease and I couldn’t get a hold of it because of its ginormous size. I would have enjoyed some lettuce or any other vegetables other than the red peppers though. There were overwhelmingly big pieces of red peppers and very few onions !! — The thing I dislike the most is soggy buns and the bottom piece of bread was SOAKED. It was crazy filling though…only could eat half of it. I did like the sweet potato fries though. They were not mushy, but crisp and hot to touch. I tried also a bite of the gator burger…was not very satisfied — as I encrypted an image of a baby gator with all its scaly skin pulled apart. Oh, no…It was strangely very salty. Don’t think I could have handled a whole patty of that. It was mushy..and salty..beglhlegeh. 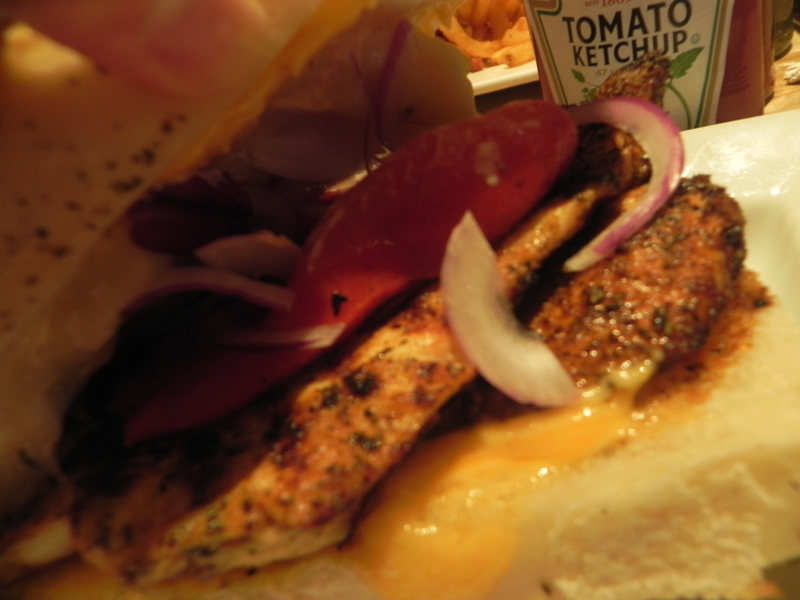 Posted on June 22, 2013 June 22, 2013 by pinkytwinkieeePosted in New York, staten islandTagged alligator, bayou, cajun, casual, chicken, clifton, crocodile, date night, date place, dating, delicious, dinner, food, fries, full bar, live music, lunch, potato, restaurant, romantic, salad, sandwiches, southern, special, sweet potato fritters, unique, wraps.